Everyone loves the idea of a room filled with natural daylight, so how can we maximise the entrance of it? Why Should You Be Maximising Natural Lighting? The entrance of natural light allows homeowners to use less heat, less air conditioning and eliminates the need to use artificial light. Vitamin D is an essential mineral that is often neglected in Ireland. This vitamin has numerous benefits including improving the immune system, body weight maintenance and the brain working efficiently into later life. Exposure to sunlight is the primary method in which people receive a sufficient amount of vitamin D.
The exposure from natural lighting helps people be more productive and happier. Natural light has also proven to regulate some disorders such as seasonal affective disorder. Aside from the health and energy saving benefits, natural light is also helpful for increasing the aesthetics of a space. Architects use natural lighting to give the illusion that spaces appear larger, illuminate an interior structure and overall increase the beauty of a space. A great principle to follow is that the higher the angle the daylight is coming from, the more intense the daylight will be. So if you want to maximise the light coming in through, for example, a set of glazed patio doors, then have them as high to the ceiling as you can. The glass in these aluminium clad sliding patio doors allows for the maximum entrance of natural light and to travel across the room. By strategically placing your windows higher, you allow for a greater amount of natural lighting to enter. If privacy is of concern to you, this setup would also be an added benefit. Mirrors are an easy and cost efficient way to increase the natural light in your home. The seemingly infinite set of reflections creates a sense of endless depth, making the room feel bigger and lighter. 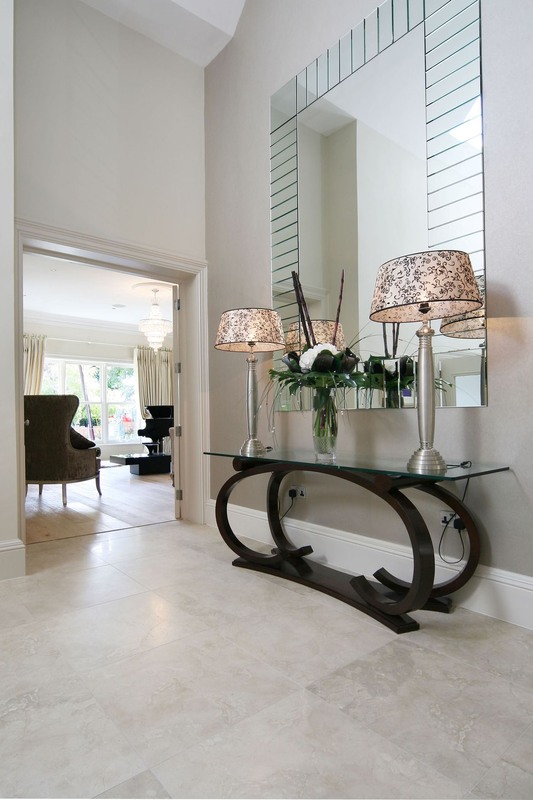 Place a very large mirror beside a window or opposite to a window, on the wall or on the floor. Not only will this increase the entrance of natural light into your home, but it will also increase the size of your room in terms of perspective. By opting for bright white walls and pale neutrals, this will allow daylight to bounce around and create a calm and well-lit room. Using contrasting colours will prevent your room from feeling sterile. If you do however opt for a dark coloured wall, it is advisable that your ceiling should be a slightly lighter colour. Beside’s the aesthetical beauty that curtains often bring, they also offer a sustainable way to maximise energy efficiency. However, it is important to make sure that your curtains aren’t prohibiting natural daylight from entering your room. Make sure that the curtain poles are long enough to be drawn back beyond the window frame. If possible, avoid heavy curtain styles and opt for a lighter fabric. A simple yet effective piece of final advice for maximising natural lighting in your home. By keeping your furniture, floors, and windows clean you will let the natural light you do have shine its brightest! If you’re looking for some inspiration for your next home project, why don’t you check out some of our case studies by clicking on the link below?